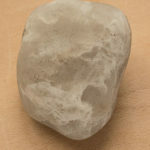 An ordinary stone, simple, smooth, small and white. How many ways can you see that stone? How many ways can you create with that ordinary stone? That was one of the tasks given to the participants of my Seeing with New Eyes Retreat for beginning photographers a few weeks ago at New Skete Monastery. They were each given a small, white stone (remember my penchant for collecting stones?) and a card with instructions to carry the stone with them throughout the weekend and create a number of different images that included that stone. Even without a camera, you can practice the art of seeing ordinary items in new ways. Give it a try this week! This entry was posted in Filling the Well, Seeing and tagged Creativity, Inspiration, Nature, Retreats, Rocks on October 14, 2015 by gail. I spent a few days in Golden, Colorado last week. Since last fall I have been part of the Gold mastermind group with Alyson B. Stanfield, the Art Biz Coach. It is a diverse group of artists that includes painters, collage artists, jewelry designers, paper artists, and this lone photographer. It’s all art, though, and we worked together to help each other better market that art. As one who works alone much of the time, the creative synergy of a group was so energizing and inspiring. I had given myself the gift of going a day early so that I had an extra day to explore Golden. Much of the day was spent wandering the beautiful historic area and the lovely campus of the Colorado School of Mines, taking pictures, and drinking lots and lots of water to combat the fatigue and vague queasiness that came with the high altitude. I was traveling light in regards to camera equipment, having brought a small Canon G16 that has an amazing amount of functionality for a point and shoot camera. Sometimes, it’s not convenient or even necessary to carry my big equipment and the G16 is great for those times. Often when traveling, I come home with at least a few stones, so it’s surprising that while visiting this place rich with stone and rock that I didn’t have an extra 10 pounds in my suitcase. I did find a few stones to photograph, however. This one, in particular, was beautiful with the sandstone and quartz and a few other things that I couldn’t identify. But, for one, it was part of the sidewalk design and it was the size of a 5 year old, so taking a few close-up pictures of it and making mandalas would have to suffice. The soft rosy glow and the complexity of these patterns are a prefect representation of my week in Golden. It was a good Golden week. How was your week? If you know someone who would enjoy my work, I’d be happy if you would share this with them. This entry was posted in Mandalas and tagged Colorado, Inspiration, Love to travel, Mandalas, Nature, Patterns, Red, Rocks on April 9, 2014 by gail. I love this image just as it is, a perfectly composed still life but I thought it would be interesting to see what patterns were hidden within. As always, there were, indeed, some interesting and lovely patterns to reveal. This entry was posted in Mandalas, Practicing, Seeing and tagged Lake Ontario, Mandalas, Patterns, Rocks on November 25, 2013 by gail. It’s been a less than peaceful Sunday afternoon. We were away visiting family for the weekend and I came home knowing that I had about an hour’s worth of work I needed to get done for Monday. All easy stuff. Except that while I was away, the tech gremlins descended upon my office and wreaked havoc. Nothing worked as it should when I rebooted my computer. Hard drives seemed to have disappeared, keyboard wouldn’t work, random windows would spontaneously open. Thus my “quick hour” of work turned into 5 or more frustrating hours of trying to sort things out. Well, they are semi- sorted out enough that I am hopeful I can accomplish what I need to tomorrow. The thing is, I always schedule my Monday post to publish at midnight so that you are all welcomed to Monday morning with some mandalas. Even though the mandalas were created the other day, I hadn’t written the post yet. At the moment though, I don’t feel like I have the brain power to write much interesting about those mandalas but I don’t want to miss being a bright spot in your Monday mornings. Then I remembered my delight when I discovered this stone mandala that someone had created on a beach where I spent 3 solitary hours exploring while on Block Island. What a gift that was when I found it and a gift today to be able to easily share with you without any deep thought. Well maybe just a little. Just the thought that we are given many gifts each day and how often do we recognize them as such? And how often do we send gifts out into the world, as this mandala creator did, never knowing just how they may touch someone else? This entry was posted in Mandalas, Practicing, Seeing and tagged Block Island, Gifts, Mandalas, Nature, Rocks on October 14, 2013 by gail. Today’s not only later than usual (it is still Monday, though) but a bit of a different than usual take on mandalas. I spent a wonderfully creative weekend with a couple of other photographers. We truly just played and spent a lot of time saying, what if you do this or maybe that? 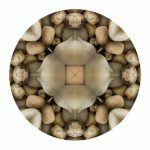 As I was going through the 625 images from the weekend and thinking about what I was going to do for Monday’s mandalas, a few of the images struck me as natural mandalas. So instead of my usual way of creating mandalas, I decided to just let these “be”. 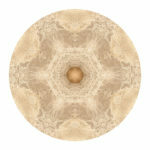 The first and last are as I saw them, just cropped and presented in a way to enhance their “mandala-ness”. The middle two are a result of my playing with motion. I purposely moved the camera when I took the images. With the stones, I duplicated it just once and flipped it around to mirror itself so that it would create a circle of the stones. Where might you see mandalas in your everyday journeys? This entry was posted in Mandalas, Practicing, Seeing and tagged Fire, Flowers, Mandalas, Nature, Patterns, Rocks on September 9, 2013 by gail. Last week, I mentioned that I’d been working in the garden and rediscovered one of my garden rocks that was worthy of a few photographs. As I’ve said in other posts, my garden probably has as many rocks as it does flowers and herbs. And those rocks are put there intentionally, not the kind that gardeners become annoyed with and try to remove from the space. I intentionally bring home rocks from my travels and put them in the garden. So, this rock has been in my garden for some time and I hadn’t specifically noticed it lately until I was doing some major reorganizing and moved the rocks out of the way of the hoe. When many of these rocks were first put in the garden I wasn’t making mandalas so I wasn’t looking at them in that way. 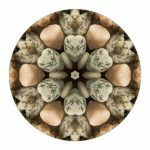 A few months ago I made some mandalas with images of various rocks, the most beautiful ones being from rocks that were made of either rose or white quartz. When I saw this particular rock, with what I believe is both rose and green quartz, I knew I had to see what sorts of mandalas it would reveal. What do they make you think of? To me, they have a sense that is both ancient and sacred. This entry was posted in Mandalas, Practicing, Seeing and tagged Garden, Mandalas, Patterns, Quartz, Rocks on June 17, 2013 by gail. In Europe, cobblestones are ever present. Usually they tend to be more symmetrically laid out than this group that I came upon while in Zurich. Nevertheless, I liked the patterns that these randomly arranged stones created and was drawn to capture this image, isolating the stones and their patterns. At first it seems a very monochromatic image but then you see the shades of green moss at the edges of the grey stones and the brown soil and then that one reddish leaf over to the left. 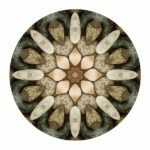 At the time, I didn’t think about making mandalas with the image but when I came across it later thought it could be interesting to see how those patterns might generate further patterns. 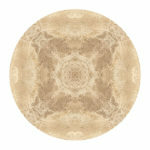 Wouldn’t it be cool to design a courtyard using one of these mandalas!? Next week and after, I’ll be moving away from my Swiss images for a while to use some newer ones I’ve taken recently as well as a few I specifically have in mind to create in order to make mandalas. I’ve been working in the garden a lot lately, where most of my considerable rock collection resides, and came across at least one that begs to be photographed. This entry was posted in Mandalas, Practicing, Seeing and tagged Mandalas, Patterns, Rocks, Switzerland on June 10, 2013 by gail. A couple of weeks ago when I photographed some of the individual rocks in my collection, I also took a few shots of rocks in a group, actually they are in a jar and I just shot down into the jar. 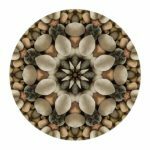 The shots of individual rocks, one predominantly rose quartz and the other white or clear quartz, created some very interesting mandalas (both here and here) but the image of a group of rocks went in a totally different direction when in came to creating mandalas. The way the light filtered down through and around the rocks heightened the sense of dimension in the mandalas. It’s amazing to me that after creating so many of these mandalas, I am still surprised and delighted by the patterns that emerge. I hope you are too. Next week, I will have some more re-imagined flowers for you. Stay warm until then! This entry was posted in Mandalas, Practicing, Seeing and tagged Mandalas, Patterns, Rocks on February 25, 2013 by gail. 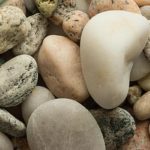 Last week, I wrote about my rock collection and photographed some of them to use for mandalas. Last Monday’s mandalas were created using an image of a rock that contained quite a bit of rose quartz. This week, I used an image that I took of a small stone comprised entirely of white or clear quartz. White quartz had always been one of my favorite stones. It is fairly common and is particularly lovely when smoothed by the ocean. These mandalas remind me of antique lace. This entry was posted in Mandalas, Practicing, Seeing and tagged Mandalas, Patterns, Rocks on February 18, 2013 by gail.